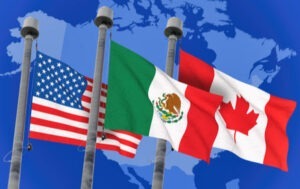 The Wall Street Journal and other international media are reporting this week that hopes are fading for a successful rewrite of the North American Free Trade Agreement (NAFTA), at least for this year. Negotiators representing the three countries reportedly appear too far apart to reach a deal before a self-imposed deadline of this week. This week’s deadline represents the window of political realities now closing. The presidential and congressional election season within Mexico, leading-up to a general election in July has begun with candidates actively campaigning. NAFTA, and the U.S. position relative to concessions are a common talking point. Likewise, U.S. Congressional elections occur in November, and the Trump Administration’s hopes to gain Congressional approval of a new trade pact had to occur prior to a termed soft deadline of this week, in order to fast-track trade-pact legislation approval prior to the U.S. Fall election. Some reports indicate that U.S. legislators and certain businesses are not pleased with some of the proposed provisions being discussed, and that will further delay any adoption process. According to the WSJ, negotiators showed willingness to continue pursuing an agreement in the weeks and months ahead, suggesting that any consensus of agreement will take additional months. President Trump has often threatened to withdraw from NAFTA, and perhaps negotiators representing Mexico are likely willing to wait-out that threat if the country does not gain threshold benefits. Some of the contentious areas for Mexico are those related to a five-year sunset for any NAFTA trade agreement along with requirements that Mexico raise the minimum wage levels of auto workers in the country to a stated number higher than the current $3 per-hour average. Canada, on the other hand, remains somewhat optimistic toward achieving a trade agreement, but here again, timing becomes the open question. Trade tensions are similarly tense and likely to increase among the U.S. and Eurozone, after President Trump recently elected to scuttle the previously signed Iran Nuclear Agreement. That has placed European countries willing to maintain the tenets of the existing Iran agreement, in a difficult quandary if the U.S. moves ahead with threatened severe sanctions including trade restrictions. Such countries could retaliate with their own sanctions on U.S. goods. A recent World Trade Organization (WTO) trade ruling imposed on improper subsidies granted to Airbus, petitioned by the U.S., and specifically Boeing, adds to trade tensions. A similar case filed by the Eurozone against Boeing, for improper government subsidies is scheduled for a ruling in the next few weeks. As noted in our blog posting earlier in the month, there has been little progress in high-level trade talks among China and the U.S., fueling added concerns to a potential trade war among these two influential nations. The implication for industry supply chains remains an extended period of uncertainty as to landed-cost or product sourcing decisions. Contingency and what-if scenario planning is a given, as-is continually updating C-Suite and line-of-business executives on various supply chain risk factors or risk mitigation needs. The geo-political landscape is indeed tense across many regions, and the reality of globally-extended supply chains remains subject to added risk, cost, or other factors. Massive Recall of Eggs Unfolds in the U.S.